Lauflicht 3, Other Sequencer from HardsequencerCie. 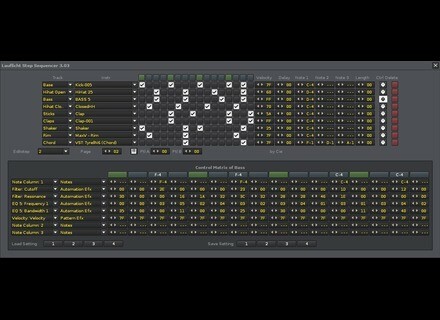 HardsequencerCie launched the third version of their Lauflicht plugin which allows for using multiple Launchpads with Renoise. The Lauflicht Step Sequencer for Renoise makes of your Novation Launchpad a moving light multitimbral step sequencer with 8, 16 or 32 Steps, with unlimited tracks, and the possibility to use your own samples, MIDI or VSTI instruments for each track. Version 3 allows for using multiple Launchpads and build a big 16 (with 2 Launchpads) or 32 (with 4 controllers) hardware step sequencer, with different note resolution. Pattern load mode: load one of up to sixteen stored patterns in real time into the step sequencer. You can even mix the tracks of two different patterns. Lauflicht 3 is available for 24€. You can download a demo version at www.stepsequencer.net. Unveil v1.6 adds 64-bit on Windows Zynaptiq released today the v1.6 update for their Unveil de-reverberation and signal processor, which enhances the global performances of the plugin. DiscoDSP launches Discovery Pro 6 DiscoDSP released the sixth version of their Discovery Pro virtual synth, which bring new filters. The Scuffham S-Gear plugin in AAX format Scuffham guitar amp simulation plugin, S-Gear, is now available in 32-bit AAX format for Mac OS X and Windows.